Smigiel, the end or a new beginning? A Romanian-built diesel railcar awaits its passengers at Smigiel. A meeting took place this morning between the senior management of SKPL and Wiktor Snela, the Mayor of Smigiel, and his senior councillors. Both teams had their legal advisers present. The meeting took place in a cordial atmosphere and both sides emphasised that they were committed to finding a formula which would guarantee the long-term future of the railway. SKPL pointed out that the economics of the line were marginal and that removing additional funds from the railway would lead rapidly to its technical death. The Smigiel Council team pointed out that charging local taxes was a requirement of the law and that any attempt to circumvent this could lead to individual councillors being charged and fined. Tomasz Strapagiel, the chairman of SKPL, stated that SKPL would immediately issue a letter terminating its operating agreement with the Council, giving the Council three months notice. SKPL would also pay the Council the local taxes as calculated by the Council in respect of its licence agreement in respect of the period during which the Council actually owned the railway land. Both sides confirmed that each would continue to search for a formula which would enable the line to continue its operations in the future. 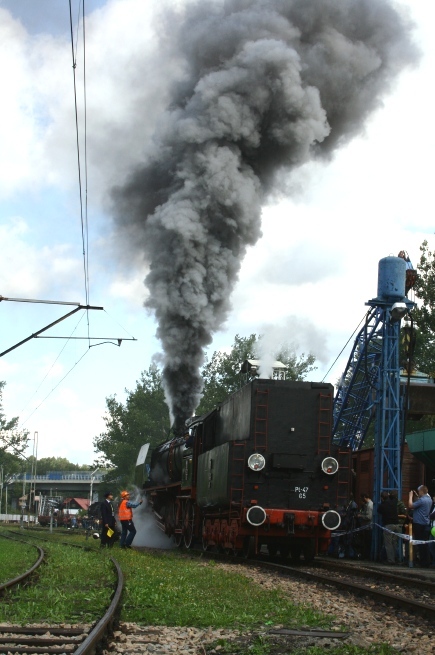 Ty51-228, the last Cegielski steam locomotive built for PKP, though not quite the last Ty51 ever built in Poland. Photo ©Damian Burdka. The historic H. Cegielski – Poznan S.A. (HCP) engineering company is on the verge of bankruptcy. 500 workers were laid of last week another 800 await their fate. The company was founded by Hipolit Cegielski in 1846. The company’s beginnings were in building and maintaining traction engines and agricultural engineering. After Poland recovered its independence, the company gradually focussed on the building of railway locomotives and rolling stock and grew rapidly employing 490 people in 1917, 990 in 1920 and 5080 in 1923. During WW II the company’s works were seized by the Germans and turned over to the manufacture of arms and other equipment for the German army. After the war, the company returned to railway engineering, becoming the most important railway works in Poland. In 1953, Poland’s government renamed the works the Joseph Stalin Metal Works in Poznan, but this attempt to inculcate a communist zeal in the workforce badly misfired and in 1956 a number of strikes erupted in Cegielski’s factory and several other factories against the communist government’s policies. Shortly afterwards, the company regained its original name: H. Cegielski Metal Industry Complex in Poznan. In 1956, the company purchased a licence from the Swiss company, Sulzer Brothers Ltd, to manufacture a range of diesel engines and in 1959 acquired a second licence from Burmeister Wain in Denmark. In 1958, the company delivered its last steam locomotive and moved its focus to the building of large diesel marine engines. In 1970s, Ciegielski began to build diesel locomotives for PKP (classes SP45, SU46 and SP47) and later electric locomotives (classes ET41, EU07 and EM10). In the 1990s, the company reorganised its business and formed 9 subsidiary companies, including Fabryka Pojazdów Szynowych (Railway Rolling Stock Factory). Unfortunately, the reorganisation and pursuit of ISO 9001 certification was not sufficient to guarantee the future of the company which became known for taking proven older designs and updating them with electronic controls. Examples of this practice include the company’s 123N high-floor trams and its RT-Flex or ME-C marine diesel engines. One of Ciegelski’s last railway orders was awarded in 2007, a 10 million PLN contract for the general overhaul of 10 EU07 locomotives for PKP Cargo. However, by then the bulk of Ciegielski’s business was the supply of marine diesel engines to the Polish shipyards. With the virtual shutdown of Poland’s ship building industry it is difficult – bar the sudden arrival of a white knight – to imagine a future for this iconic company. King’s Cross Station, 2007. From a photo by David Iliff. Just a brief posting, as regular readers of BTWT will no doubt guess, I am somewhat busy these days. Have you heard the story about a couple of lasses from the Railway Museum in Warsaw who were sent by their boss to visit the National Railway Museum in York? They flew to London (few Poles seem to know that some of Britain’s other cities have airports as well) and spent the evening with friends. In the morning they joined the ticket queue at King’s Cross station. Imagine their surprise when they discovered that the walk-on fare to York was double their weekly wage. In the end a helpful ticket attendant pointed out that if they waited several hours and left King’s Cross after 09:30 they could buy an off-peak return. How many of the millions of tourists who visit Britain every year experience a similar dénouement? At what cost to the UK’s economy? For years ‘independent’ consultants financed by the road lobby have argued that in order for Britain to maximise its tourist potential the country needs more road investment. Having all but destroyed the UK’s railway network they are now busy selling their bad advice to Poland. The end of the line – Wielechowo Station. When Dyspozytor first travelled on the Smigiel Railway the track was still in place from here to Rakonowice. How long will it be before the rest of the line looks like this? Photo BTWT. The first of what we hope will be many letters from BTWT readers to the Mayor of Smigiel regarding the future of his railway. Thanks Robert! D.
Being a British citizen with a great love of Poland and its national heritage – and who has taken many enjoyable holidays in Poland, including visiting Śmigiel and travelling on its narrow-gauge railway – I hope that my writing this letter to you will not cause offence. I learn that the Śmigie Town Council, having lately become the owners of the land and infrastructure of the 750mm gauge railway serving Śmigiel and surrounding area, are now proposing to charge the railway society SKPL of Kalisz, who in recent years have been operating the railway, a large sum of money in local rates, relating to their occupation of the railway land – charges which were waived under the previous arrangement. I understand that in view of this situation and its ramifications, SKPL will be unable – with these terms applying – to continue to operate the railway. This prospect is a distressing one for me, and for many people throughout Europe and, I am sure, beyond – who are interested in Poland’s railway heritage. I would beg of you and the Town Council, to reconsider this matter, and to reverse the decision to hit SKPL with this punitive financial demand – so that they may be able to continue operating the local railway. 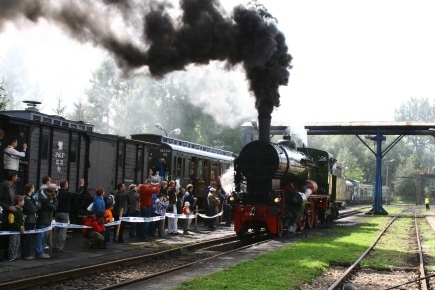 If the railway could continue the operation of its passenger and freight services – plus, as has happened in the past few years in co-operation with the “Wolsztyn Experience”, ran regular steam-locomotive-hauled services visitors from much of Europe, whose time spent in the area would enrich the local economy. 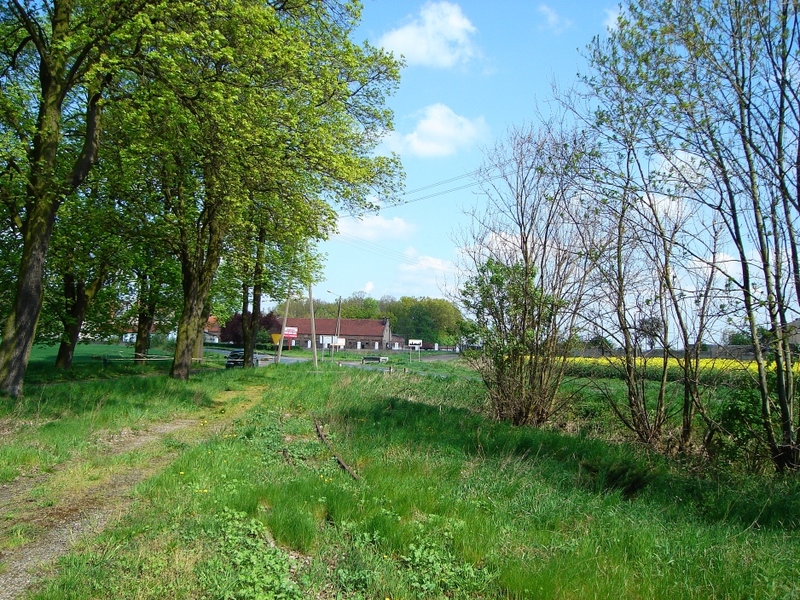 Here in Britain for example, we now have absolutely nothing like the Śmigiel local narrow-gauge railway (a narrow gauge railway providing a genuine public transport service) – lots of us would love to come to Poland, to enjoy there, what we cannot enjoy back home. 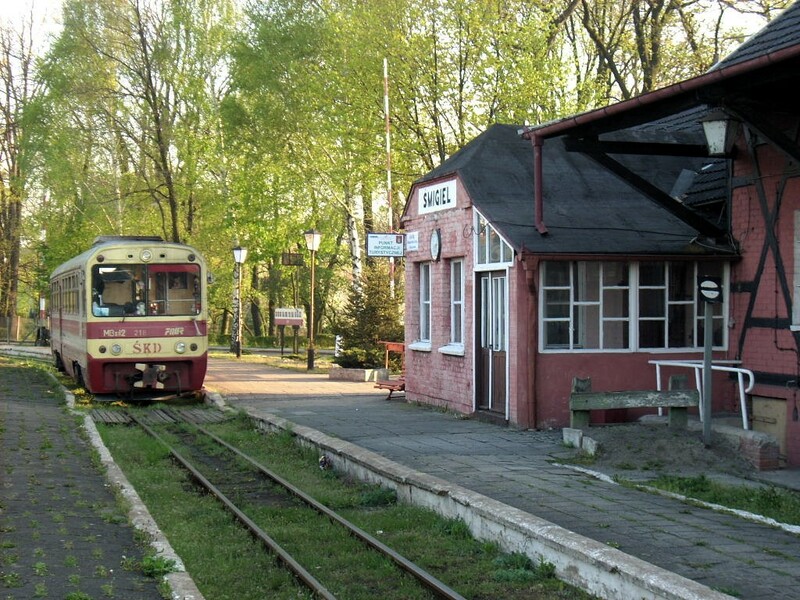 Should the line continue to run in years ahead – as well as and providing useful service for people in the area, it would draw many railway-interested tourists, who would spend money in Śmigiel. Entreating you to give the local railway a chance, doing which would benefit all concerned. Refurbished EMU at Lodz Kaliska bound for Kutno on 15.09.2009. I enjoy travelling by osobowy train. I find a window seat away from the sun and watch the Polish countryside wind slowly by. People come and go. Old ladies shout into their mobile phones, young ladies smile and read their books. To travel hopefully is a better thing than to arrive. Osobowy trains may be a trifle slow, but they are by far the cheapest way to travel by rail in Poland. Take the journey from Lodz to Poznan. I could have taken the refurbished EMU above – the 15:44 to Kutno. I would have arrived in Kutno at 17:12. There I would have caught the 17:53 Eurocity Warsaw – Berlin train as far as Poznan Glowny, arriving there at 19:24. The whole 247 km journey would have cost me 86 zloty (£18.65). Kutno Station is not a nice place to wait 41 minutes for a connection. Unrefurbished EMU at Lodz Kaliska bound for Kutno on 15.09.2009. So instead of the 15:44 I took the 15:33. This PKP Przewozy Regionalne osobowy train runs all the way to Poznan. It arrives at Poznan Glowny at 20:28, but in my case I needed to get out two stops earlier at Poznan Staroleka at 20:17. And the cost of my 246 km journey? Only 26 zloty (£5.64)! 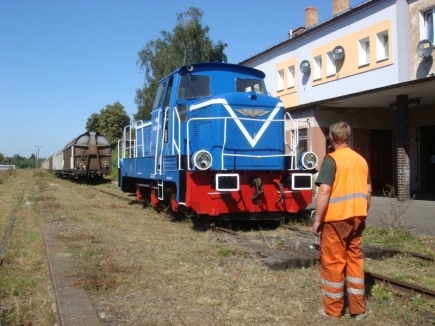 Kalisz Railway’s WLS150 – 7223 diesel shunter. Photo BTWT. Making the most of travelling by osobowy train is more an art than a science. Careful observation repays dividends. At Opatowek – the interconnection with the SKPL’s narrow gauge Kalisz Railway – I managed to photograph the line’s WLS150 locomotive – formerly at the Zbiersk sugar refinery – out in the evening sun. Prussian 4 wheel goods van at Kalisz Station. At Kalisz station I caught a pre WWI Prussian goods van waiting for a good home. Amazingly one of my photos of the van even appeared on the ‘Railway Eye’ blog! Before Poland regained her independence in 1918 Kalisz was the interchange between the Russian gauge and the standard gauge. After Kalisz it became to dark for photography, but it stayed bright enough to look out of the window for another hour or so. By the time we go to Sroda Wielkopolska it was pitch black. 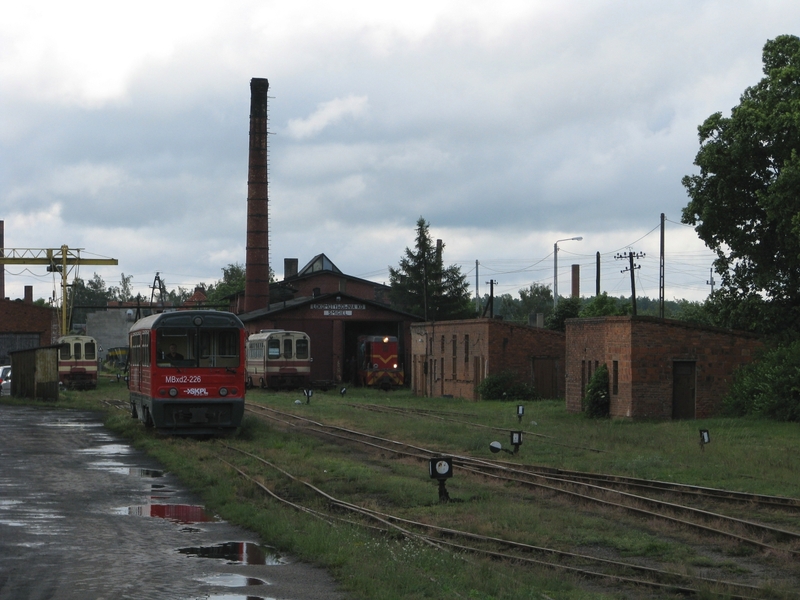 Sroda is the home of Poland’s last narrow gauge railway where all trains are hauled by steam, but that is another story! Will the Smigiel workshops become the site of a petrol station? Yesterday (14 September) SKPL, the railway society responsible for operating the Smigiel railway, received a letter from the Smigiel Town Council proposing a change in the Society’s operating licence. Under the new terms, SKPL would become responsible for the payment of rates and other local taxes amounting to some 40,000 PLN (approximately £8,500) per annum. Up to now PKP, the Polish State Railway Company, was – in theory – responsible for payment of local taxes. In practice, in such cases PKP does not usually make any payments, but lets its local tax debt accumulate. Then when PKP transfers the railway land to the local authority it negotiates a ‘debt forgiveness’ agreement and the slate is wiped clean. Until very recently, PKP was still the owner of the Smigiel Railway land and responsible for the local taxes. Now the transfer formalities have been completed, Smigiel Town Council are the owners of the railway land and want to saddle SKPL with the rates bill! 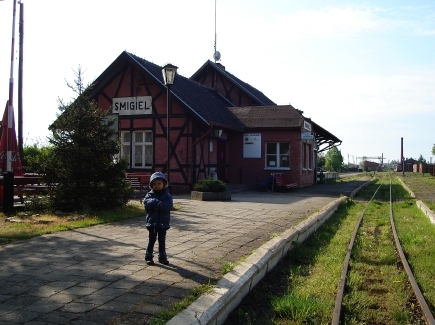 The Smigiel Railway’s passenger services are used mostly by school children and are subsidized to the tune of some 100,000 PLN by the Wielkopolska provincial government. The provincial governor’s office has indicated that the Smigiel Railway would have received a larger subsidy if the Smigiel Town Council also provided some financial support to its railway. In spite of earlier promises, the Town Council have yet to make any contribution. Now, by saddling SKPL with a bill for local taxes, the Council are sequestering nearly half of the provincial government subsidy for themselves. Cynics might conclude that the Town Council want to force SKPL out so that they can use the railway land for other purposes. SKPL held an emergency board meeting today and decided to inform the Town Council that they are unable to continue to operate the railway on the new terms. We understand that SKPL intends to run services until the end of the year. Will Smigiel Station become the site of a children’s playground? The aftermath of a collision on the Radebeul-Radeburg railway on 13.09.2009. Photo ©MDR/Uwe Klost. 52 people were injured, 4 seriously, when two trains collided on a preserved railway in Saxony in Germany on Saturday evening. An enhanced service was being operated the 750 mm gauge Radebeul-Radeburg railway to celebrate the 125th anniversary of the line between Moritzburg and Radebeul. After the accident all services on the line were suspended. The accident involved 99 1789-9, one of the line’s modern 2-10-2T locomotives built in the 1950s and 20, a much older 0-8-0 locomotive. A preliminary inspection reveals major damage to the 0-8-0 and to the coaches it was hauling. Around 250 people were riding on both trains on the single-track route. Police have started an investigation into the cause of the accident. According to police. the 52 injured included 7 children under the age of ten. Town square Zamosc. Photo Maciej Ukleja. Starting 1st September, PKP InterCity has cut 10% of its long-distance services. Most of the slashed trains are pospieszny (semi-fast) trains which PKP IC had taken over earlier this year from PKP Przewozy Regionalne. Many trains have been cut back and no longer run the full distance forcing passengers to change trains or take a bus for part of their journey. Other trains only run on one or two days a week. Slupsk and Rybnik have lost their direct services to Poznan, Katowice and Gdansk. Lodz has lost its direct train from Szczecin as well as trains to Czestochowa and Cracow. While Zamosc, with 66,600 inhabitants and a UNESCO world heritage site has lost all its rail passenger services. Sir Nicholas Winton in 1939 with one of the children he rescued. In December 1938, 29-year-old London stockbroker Nicholas Winton was preparing to take a skiing vacation with a friend in Switzerland. But that friend — who worked in the British Embassy in Prague — insisted Winton come to Czechoslovakia instead to see what was happening there. What Nicky Winton found in Prague in December 1938 were refugee camps filled with families, many Jewish, who had fled the Nazis and had nowhere else to run. Because no one would take them in. Winton could not leave Prague. He became fixated on getting the refugees to safety, especially the children. Using a table in his hotel’s lounge area as his office, Winton began writing every possible government to find safe haven for the children of the Prague refugee camps. And parents began seeking him out to have their children listed for transportation to safety. The only governments willing to allow entry were Sweden and Britain — Britain reluctantly, and only if every child had a sponsor signed up to take him or her in and only if a 50-pound surety (a considerable sum at that time) was paid for each child. Winton shifted his one-man rescue mission back to London and began lining up sponsors for his children. Throughout his hectic eight-month mission, Winton said the Nazis were not as much of a problem as was the British bureaucracy. The Nazis simply wanted to be paid to give the children through-passage (sometimes doubling the payment demand at the last hour) but the British were blind foot-draggers. Few in the British government thought the refugees were in immediate danger. War? What war? We gave Hitler Sudetenland. Everything’s fine. As 1939 dragged on and the British government dragged its heels, Winton and his growing organization took to printing forged admission papers for children who were approved, but whose papers were not forthcoming. Sir Nicholas Winton, 100, was at London’s Liverpool Street station this morning to welcome passengers on board a very special ‘steam special’ from Prague named after him. 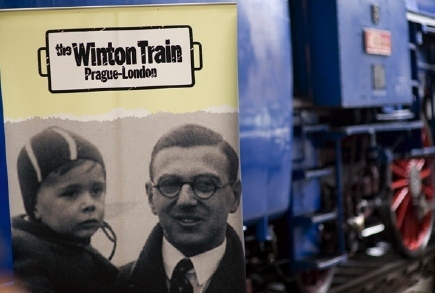 The train organised by Czech Railways, followed the route taken 70 years ago by 8 trains that he organised that brought 669 mostly Jewish children to the UK. A ninth train, with 250 children on board, had been due to leave on 1 September 1939 – the day war broke out. German troops prevented the train’s departure, then, under Gestapo orders, the train moved out. The 251 children aboard were never seen again. Twenty-two of the original evacuees took part in the anniversary journey. The A1 Locomotive’s Trust A1 pacific Tornado hauled the British leg of the trip from Harwich to Liverpool Street Station. Steam Blog – Prague-London, by steam! September 1, 10:00 hrs. SLPL runs onto PKP PLK tracks to collect its train. Photo SKPL. The inaugural train arrives at Srem. Photo SKPL. 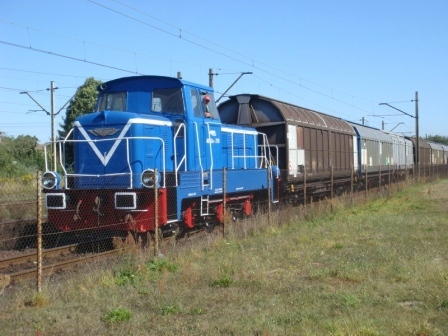 On 1st September, the inaugural run took place of the first SKPL operated Czempin – Srem freight service. SKPL are interested in developing the service and are looking for ideas to make the line attractive for tourists. The possibility of running steam-hauled freight trains and mixed trains is being investigated. Anybody with a standard gauge steam engine looking for real trains to haul need look no further! German cadet spotting the fall of the shells aimed at the Polish navy depot at Westerplatte, from the German Navy’s training ship SMS Schleswig-Holstein. At the end of August 1939, a German Navy training ship, the WW I battleship SMS Schleswig-Holstein, sailed to Gdansk, under the pretext of a courtesy visit, and anchored in the channel near Westerplatte. On, 1 September 1939 at 4.45 a.m. she began to fire 280mm and 170mm shells at the small Polish naval depot there. The Second World War had begun.